She describes her home as “four bedroom, split level, two bathroom, alfresco under roof line, double garage situated on a small/medium sized block”. I asked Jodie a few questions about the experience of creating her new home. First up are the top five tips I’ve summarised from her experience … and then keep scrolling to read through our conversation and the detail of her experience. She has some great advice for those starting out on their new home building journey! Bricks and Mortar – visit display homes and suppliers of materials, fixtures and fittings. Get familiar with what products are like in cost and quality, what you like and what you don’t. Look carefully at their finished homes – the quality of finish and fixtures. Open doors, slide windows, wiggle tapware, look up and down and over everywhere. Ascertain reputation – both historical and how they’re moving forward. Have they been around a while? Do they operate like someone who cares about you and your home, and will continue to well into the future? Do a license check with your state authority to see if they have any black marks against them. If there’s something that bamboozles or overwhelms you, get help. People who do this professionally can have a lot of good ideas and can sift through yours objectively and quickly to give you clarity on how to move forward. It may be as simple as the experience Jodie had – a couple of hours with an interior designer to help make a few decisions. It will give you peace of mind worth much more than the cost. Start – Who’s handling the design changes, the approvals? Completing – How will the job be finished? What will actually happen? And can you bring external people in at that point to help you assess how good a job has been done? And how much notice will you get that the end is near? I did a survey of people who have recently finished creating their homes, and electrical and lighting came up as a challenge for most of them. Follow the tips I wrote within the blog, and you are well on your way to getting this sorted for your home. And if not, follow my Top Tip No.3! UA: Why did you decide to build it as a new home (as opposed to renovating, or buying a new home)? I wanted to have input into the design and layout of the house. I also didn’t want to move into a house where renovation was necessary. I also wanted to know how the house was built, what was used and who built it. UA: Jodie, you did a lot of research prior to the process. Where and how did you research? What did it specifically help you with? I visited a lot of display homes, did a lot of research on the internet – I kept design ideas on Pinterest. I also visited brick, tile, lighting, roofing stores etc. and picked up lots of samples (tile, stone bench tops, paint chips etc). I also purchased a number of kitchen magazines and subscribed to the online version of the Choice magazine which help me in the research of my appliances etc. UA: How did you go about choosing/creating your new home? For starters, how did you choose your builder, Blackett Homes (in Canberra)? The quality of their finishes and standard fittings was far superior to all the others I approached for a quote. Their pricing was also very competitive. Their display home was the best one I saw in Canberra. UA: Did they design it for you? Or was it a fixed plan you chose? The design was one of their standard designs which they amended to my specifications. The changes they made for me were quite significant and were included in the cost of the home. UA: Why did you choose this process (as opposed to designing it yourself, or designing it with a draftsperson, architect, etc, or using one of the big project home companies)? The final plan, after my amendments were made, was perfect for my needs. I was on a strict budget and like the fact that my builder gave me a fixed price quote. I did get a quote from a couple of big project home companies but I was not very satisfied with their customer service and didn’t feel they would look after me as well as the company I chose. The company I chose was a local company that has been around for over 30 years and has a very good reputation. UA: Jodie, the builder included in their package 2 hours with an interior designer. You found this very helpful – was this a deciding factor for you in choosing the builder? How did the interior designer help? It was one of the deciding factors. I had lots of design ideas but was unsure how they would all come together. The greatest challenge for me was the design phase. Deciding colours, tiles, fittings and fixtures. There are so many choices these days and it’s hard to see how things will all fit together. Having time with an interior designer helped me to feel sure about my decisions. She also helped me in areas where I was unsure (like external brick, tile and guttering coordination). UA: Can you please describe the process of choosing / creating the design? How did that work? How did you create a brief? How did Blackett Homes work with you in this process? How did the interior designer work with you in this process and when did she get involved? I chose the plan that was the closest to the one I wanted. I then marked up changes and submitted it to the builder. They then sent me back the amended plans. This went back and forth probably around 4 times while it was fine-tuned. I had a designated sales person who worked closely with me and would meet me whenever needed. The meeting with the designer occurred after the plan was finalised. The designer was an independent contractor. However, she does a lot of work for the builder and knew their standard fixtures and fittings. I took along samples I had collected and discussed options with her. At that meeting I chose my internal colour scheme, tiles, bricks, guttering, garage door, external doors, cupboards, splashback, bench tops etc. I also met with the designer of the kitchen company who did the joinery for the kitchen and walk-in pantry. This meeting occurred just after the meeting with the designer. The kitchen company worked with me to design the kitchen and a built in bookshelf I had designed in the dining room. The selection of all the materials finishes and fixtures was done with the designer. However, the design of the kitchen and selection of appliances was done by me. The establishment and checking of the budget? Once the contract was signed I had a designated project manager who updated me regularly and whenever there were changes to the original contract which involved a cost increase I was given a quote and had to approve before work was done. This meant that at the end of the build there were no surprises and I knew how the budget was tracing through the entire build. The approvals with council and certifiers? My builder handled all the council planning, certifiers and approvals and sent me copies of all certificates etc. I had a long meeting initially with the builder where I asked lots of questions about the contract, the plans and the process. Throughout the build I often would ask questions about the process and that was done mainly by email and phone. Near the end of the build I had another long meeting with the builder who explained all the inspections, approvals, handover and defects period etc. UA: In our conversations, you mentioned the lighting/electrical being an area you would look through more thoroughly next time – what do you think might have helped you during that process? I’m not sure about this one because it wasn’t until I moved in that I thought about what I would have preferred. It was only a few minor things (like the placement of light switches etc) so it’s something I can get changed now. However, I guess it’s something that I wish I had thought to bring up with the designer. Did you have regular, structure site meetings that were minuted? I had site meetings whenever I wanted one. I lived near the site so I would often visit on weekend to have a walk thru. The meetings were not minuted. Could you go on site at any time? How did the builder handle your queries and requests? I had a designated project manager who happily talked to me over the phone or answered my emails. She always answered my queries within 24 hours. If there were any changes they were emailed and approved by me. How was the progress of the build reported to you – ie how did you know whether you were on program and budget? My project manager kept me updated on a regular basis. The program ended up finishing ahead of schedule. Who inspected the property for defects and incomplete work? The builder has a dedicated defects person who accompanied me and their project manager on the final inspection and worked with me over the next 90 days to fix the defects. How did Blackett Homes handover the property to you? Was it a formal completion process, or more casual? A week before handover I had a walk-thru where a list was compiled of anything that needed fixing, wasn’t finalised or needed amending. The following week I had a meeting with the project manager where I was given a folder full of all the relevant plans, certificates, warranties etc. I was given all the keys and the garage door openers etc. They also gave me a lovely housewarming hamper. How much warning did you get about when the home was going to be ready for you to move in? I was given around 3 week’s notice before the walk-thru. Did work continue to occur after you moved in and things were ‘completed’? No, everything was completed before I moved in. The only work that occurred after I moved in was the defects work. Anything you’d change about the design? What frustrates you? No, I am really happy with the design. Anything you wish you’d been able to budget in, and miss now? Full landscaping! I hate, hate, hate gardening and wish I had included that in my budget. Anything else – what particularly do you love about where you live? I love my house and everything about it. I am close to a nature reserve and have lovely views of hills and nature. My block is also located at the back of the suburb so it is so quiet! Thanks so much to Jodie for sharing your experience of building your own home! I believe that the quickest way to learning something is to speak to someone who has gone before you. Head to the Andersons Project Diary, if you want to read more about the process of designing and building your own home. 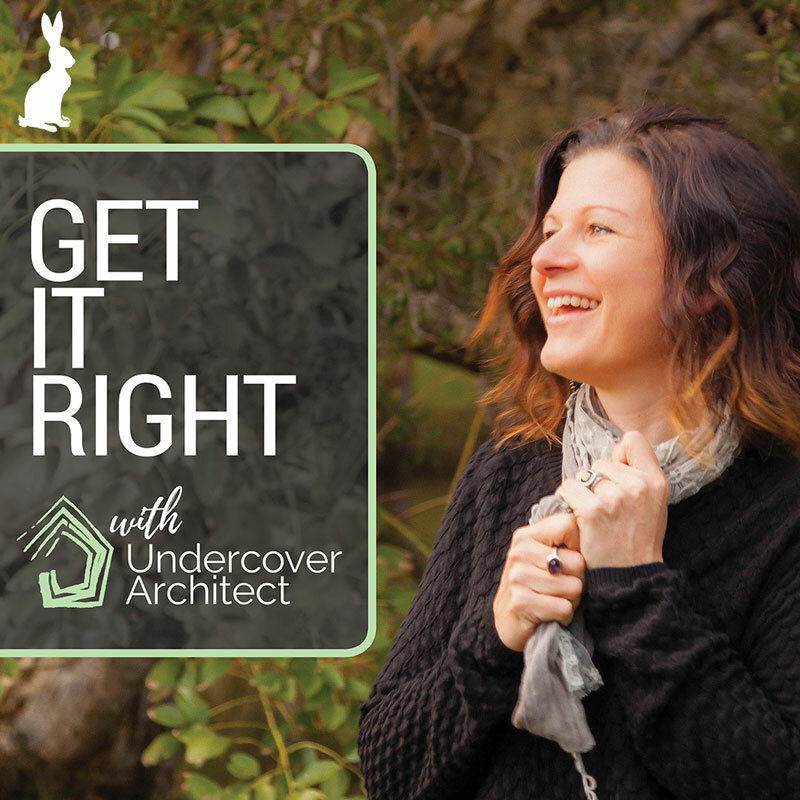 PS Undercover Architect and Amelia Lee have no affiliation with the builder mentioned in this info – all advice is given impartially or from Jodie Williams’, the client’s, point of view.